Earlier this year, I vowed to start making more homemade dressings and consuming less pre-packaged dressings. Of course, there are a few dressings I love and can’t live without, but for the most part you won’t see my refrigerator door loaded with salad dressings. 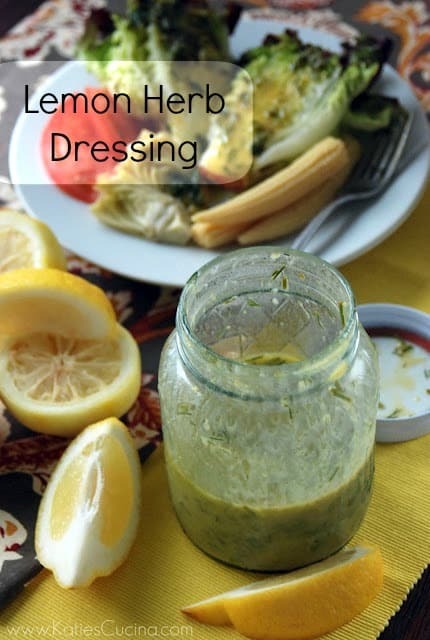 I love to cook with lemons and had yet to make a dressing with them. Since my herb garden is overflowing right now I figured this was an ideal dressing to make. Plus, who doesn’t love a light and refreshing dressing during the dog-days of summer? I also did a little experimenting and marinaded some chicken with this dressing (only for 30 minutes). Baked it with shallots and slices of lemon and garlic. It was divine. In a pint size mason jar (with lid) add the lemon juice and lemon zest. Followed by the honey, dijon mustard, and olive oil. Next up, add the freshly chopped chives, parsley, and dill; followed by salt and pepper to taste. Seal lid and shake until all ingredients are well incorporated. Refrigerate for up to 5 days. psst… if you love lemons you will love this weeks Google Hangout. Christine from Cook the Story and myself will be chatting with Beth & Julia from Live Pretty about lemons! Love, love lemons! Can’t wait!! And I love Everyday Food, great magazine, isn’t? This dressing looks awesome and I love the photographs, Katie!! Thanks Julie! I love the iPad version of EDF! I love how dynamic it is. You know I work on my photography daily! 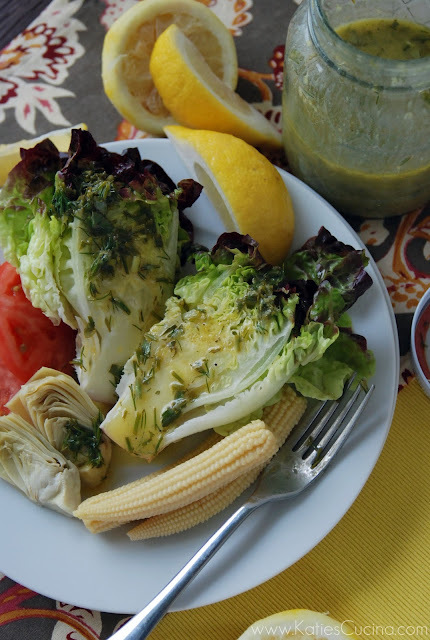 great looking dressing & salad – I love making my own dressings & customizing the flavors just how I want them. LOVE the lemon dressing!! it’s always so much better to make your own as you can control everything that goes in it. this sounds like it’s got GREAT flavor so the salad would be extremely delicious and not boring at all! Julie you got it! I love knowing exactly what is in my food! Love this recipe! Combines so many of the best ingredients for dressing. Can’t wait to try! Thanks Julia! I had a blast talking last night! I’m very picky about my salad dressings. They cannot be too heavy; they cannot be to vinegary. This one sounds absolutely perfect! I agree with you Kiersten–it’s hard to find the perfect salad dressing (unless you make your own)! Thanks Sommer for the kind compliments!